I love SQL Prompt as an add-in for SSMS. The intellisense is very handy for me and I’ve gotten used to certain shortcut combinations that make it easy for me to write T-SQL quickly and get information on parameters without opening Books Online. It’s works better than the native intellisense for me, though perhaps I’ve just gotten used to it. When it’s not installed on an instance in one of my VMs, writing code is a chore. When I was in Cambridge recently, I had the chance to sit down with one of the developers of SQL Prompt and he showed me a few things I had never seen. For the most part when I install SQL Prompt, I leave it with the defaults. There are a few snippets that I change quickly, like the ssf snippet. This normally produces a “SELECT * FROM” and I add a “TOP 10” to it in order to reduce the amount of data I bring back. 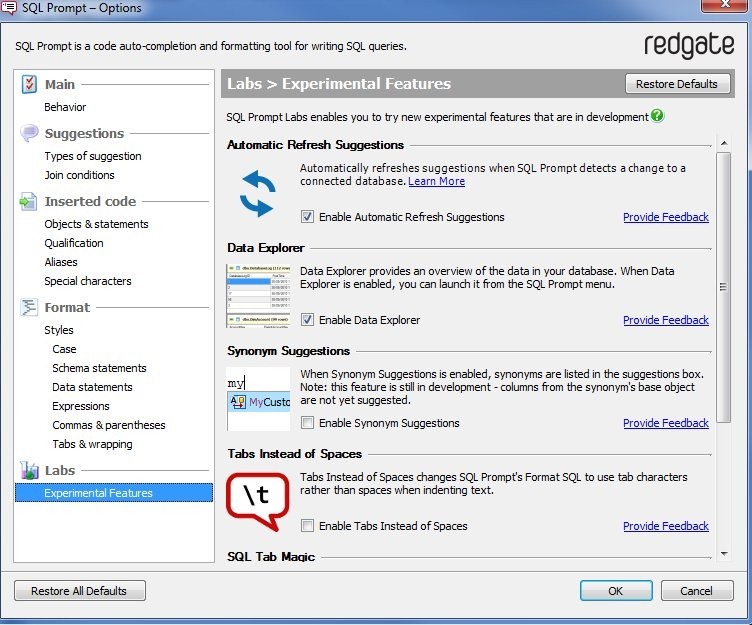 However there are a few features in SQL Prompt that are “experimental” in nature. They are complete, but not deployed into the product by default. You can access them from the SQL Prompt menu in Management Studio. This brings up the Experimental Features tab in the options dialog, which you can see below. There aren’t a lot of features, but these are ideas that have been suggested, or are working, but they developers aren’t sure if they are completely spec’d out. You can enable a few of these to see if you really want to see how they work. For example, I’ve enabled “Automatic Refresh Suggestions”. Since I tend to work in one database at a time and create lots of objects, I want this to happen. I can ALT+S, Enter for this, but I’d like to tool to do it for me. These items change periodically, and some link to related tools (like SQL Tab Magic), and they give you a chance to test the way the feature works and provide feedback. 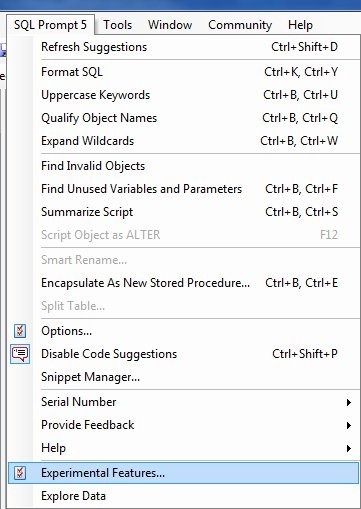 If you are a SQL Prompt user, you might check out this tab.